It's another big month, as Wolverine goes bi-weekly again, we say goodbye to Nathan Christopher in X-Factor & Chris Claremont on Uncanny X-Men, and the 90s gets dialed up to eleven as X-Force #1 is released, with its polybags, trading cards, and wall-to-wall Liefeldisms. Also, Excalibur continues to be a comic book. Interesting picture. 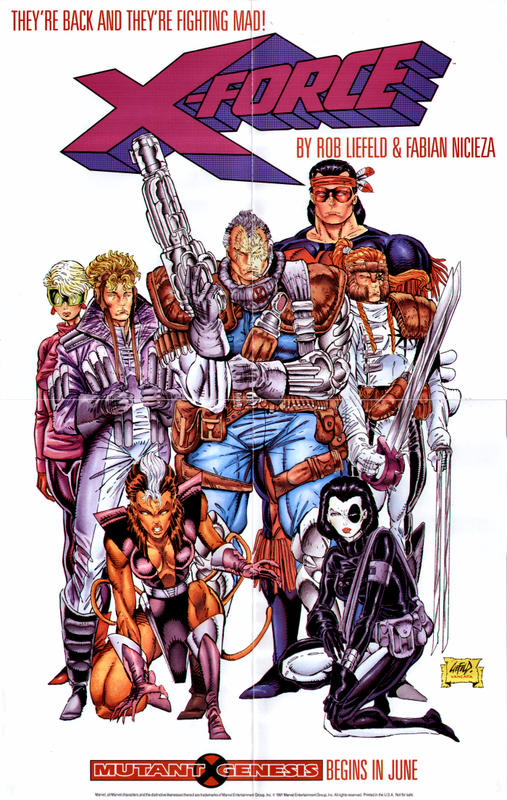 Liefeld still has Shatterstar's strap-on bladed weapon on his left-hand, and Feral's design still needs a bit tweaking. "Also, Excalibur continues to be a comic book." Yes but Davis is almost here! Can't wait to read about EXCALIBUR: POSSESSION. I've never read it myself, but Alan Davis shreds it mercilessly in his first EXCALIBUR issue, so I'm excited to see that unfold.